In Cape May, bird-wise, it seems like anything can happen at any time. The Monday morning walk at the Meadows with Pete Dunne, Steve Weiss, Barb Bassett, Chuck Slugg, and others spotted a male Pin-tailed Whydah fluttering up from high grasses and flying toward the State Park. Whydahs and indigobirds are in the small family of songbirds, Viduidae, of 20 species, all native to sub-Saharan Africa. 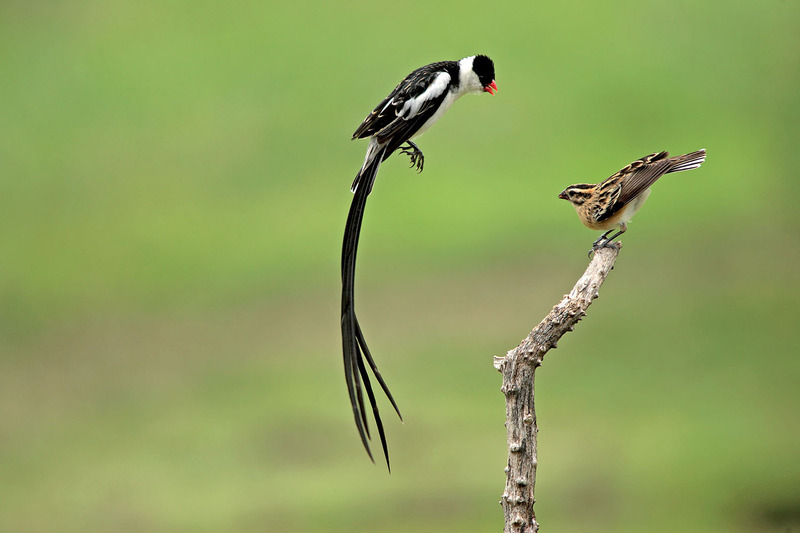 Pin-tailed Whydah is currently established and nesting in the Western Hemisphere, in southern California and Puerto Rico, as introduced or escaped exotics. Just like cowbirds of this hemisphere and cuckoos from the Eastern Hemisphere, these birds are brood parasites. This means that they find nests of other songbirds and lay eggs in them so that the "host" bird family raises the young as its own. In Africa, individual whydah species often specialize in one species to parasitize. Baby nestling whydahs even have mouth colors to mimic the host nestlings and learn the song of their hosts while still growing in the nest. That's one exotic and fancy exotic! How did this species get to Cape May this week? Often it is prudent to suspect an escaped caged bird. Pin-tailed Whydah is kept in cages, but not as often as other Old World finches. Because of its parasitic nature it is difficult to breed in captivity. While an escape is still a very viable possibility, we shouldn't eliminate the idea that this bird came from one of those established populations. But I will withhold any judgment, just simply present some possibilities. We may never know, or we might keep paying attention and some good hint will present itself. In Puerto Rico this introduced whydah reproduces successfully because of the equally exotic presence of Orange-cheeked Waxbill. In California the known host species is the introduced (noticing a trend here?) Scaly-breasted Munia, aka Nutmeg Mannakin. The common thread here is that whydahs seem to only nest with estrildid finches (family Estrildidae). Along those lines it would take another introduction to establish a whydah anywhere. Or perhaps they could adapt to another group of birds? House Sparrow isn't very distantly related from the common hosts of whydahs. Or perhaps the complex songs of our Fringillid finches (goldfinches, for instance) might help the whydahs to find breeding success. Once species adapt to some new "thing" and some new place we can observe very rapid changes. I'll leave you to your own thoughts of bird distribution and evolution while reminding us that we should always be ready to be surprised. Cattle Egrets found their way (whether boat-assisted or flying across the Atlantic Ocean) to northern South America from sub-Saharan Africa in the 1870's. But it wasn't until 1953 that their presence was acknowledged in North America as a likely expansion of those colonizing South American Cattle Egrets. In case you are wondering, those first accepted sightings in 1953 came from Florida, Massachusetts, and.... Cape May... of course! And these egrets were nesting and able to survive in more northerly clines in a very sudden way. While you are out looking for whydahs this month (haha, why not!?) go ahead and also find a Ruddy Shelduck or Black-bellied Whistling-Duck-- then we'll have plenty more to think and talk about!